SEO or Search Experience Optimisation (previously Search Engine Optimisation) is the process of improving websites usability and relevancy to make their more appealing both for search engines and users. In this article you will discover why SEO matters for businesses, what is SEO in 2018 and who should care about it. Did you know that there is more than 2.3 million searches per second on Google ?! The good news is some of these searches are related to your business. Whether people are searching for products or services you can offer or for things you know, there are plenty of opportunities to capitalise on. 81% of consumers will perform searches online before they make a purchase. If your brand do not have a strong online presence you will find it falling behind the competition. Whether you are a business owner, a CEO or in charge of marketing, the only thing that matters is ROI, so keep in mind that SEO’s drive more $ and increase profitability of other acquisition channels. SEO has an impact on every channel as the purpose of it is to improve user experience and drive qualified leads. 58% of all searches are now done from a mobile device. People have switched to mobile, so Google and SEOs need to think mobile first. From page speed to navigation and content improvement, we analyse your website, test our hypothesis and help you to make the right moves with Mobile SEO. To improve mobile search, Google will roll out in June 2018 their algorithm update Mobile First Indexing. Make sure you are ready as Mobile SEO is not the future, it’s already there ! To deliver a great user experience to their Google Home & Google Assistant users, Google need to deliver only 1 great result. And so far, there is no paid search solution. 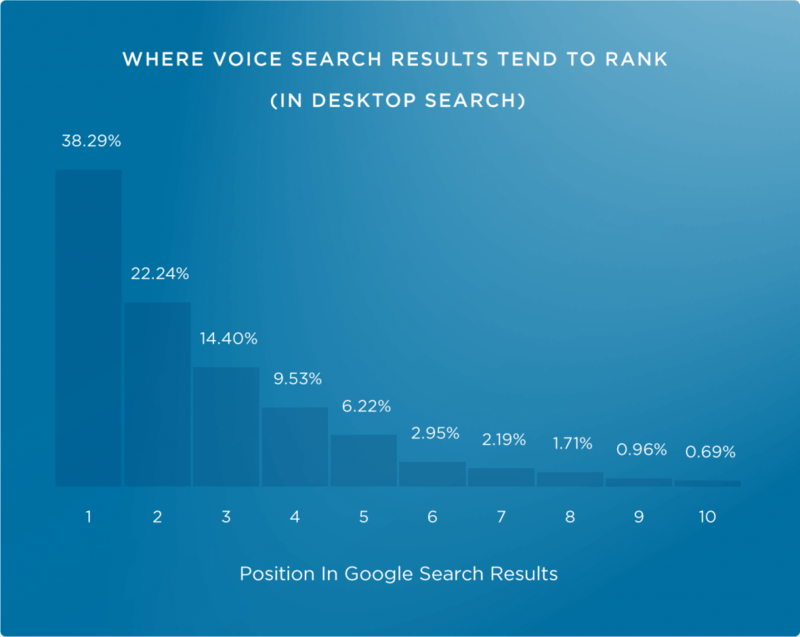 According to a research from Brian Dean (Backlinko), 75% of Google Home results came from a page ranking in the top 3 for that keyword. So if you are not the most relevant results, and so, if you are not ranking in the top 3, it will be impossible for you to appear on voice search. Being Voice Search ready is a long term work. Starts working on your SEO now before it’s too late. 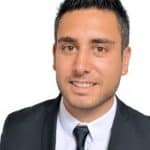 I do PPC Why should you care about SEO ? This is something I hear a lot in the industry. Well, both PPC and SEO are complimentary and if they are done together no doubt you can achieve greater results. The top 5 organic results get 67% of the clicks when no ads are showing up. When ads are showing up this figure is still decent as top 5 organic listing can get between 40 to 50% of the clicks. But it’s not all, remember that SEO is also helping you with user engagement and conversion. If you want to dominate the market, no doubt you should do both. Who should care about SEO ? While SEO has been quite a dark area over the last decade, SEO has evolved and is now a must for every brands who are serious about online marketing. B2C or B2B, big and small businesses, SEO can help you to increase your conversion rate and get more visibility on search. To understand what is SEO, we need to understand first what is the purpose of Search : deliver relevant, great and accessible content to the consumers. I wouldn’t focus too much on ranking factors & instead look at what search is trying to do: show relevant & great content to users when they ask. Some great pages use lots of images, some don’t. In 2018, SEO is not about keywords stuffing and shady technics anymore. 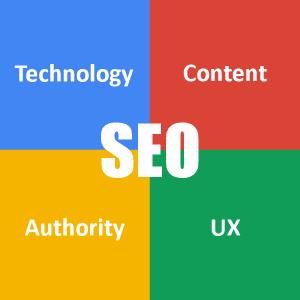 The role of SEO is to make sure a website offers the best experience by working on four pillars: content, accessibility, technology and authority. As SEO aims to improve user experience, SEO increases the efficiency of all acquisition channels. I like to say that we are the architects of the web as we help brands to create useful and visible websites, in much the same way real architects build brick and mortar stores. While SEO has been quite a dark area over the last decade, SEO has evolved and is now a must for all brands who are serious about online marketing. I’ve put together some slides to help you understand SEO. Technology : performance of your website. Does it follow SEO guidelines? Content: do you have the content that people are looking for? How is it organized? Authority: what is your website awareness? User Experience: how users interact with your website? These 4 fundamentals pillars will the basis our strategy. You probably all know the famous marketing mix created by McCarthy in the 60’s. I think this is the best way to explain why SEO is still not really appreciated by marketers, it doesn’t sit under Promotion. Indeed, SEO is sitting under Place. …and SEO’s are there to help you find the best place to build the store. Exactly like a real estate will fight to find the best spot to settle your business. I’m pretty sure that you will prefer to have your store on the left rather than on the right, am I right? So remember, whether it’s in real life or online, the only thing that matter is PLACE, PLACE, PLACE. Search engines crawl the web to find pages, then algorithms give a score to each page and decide how much your website is relevant to a specific topic that users are looking for and if it’s matching user intent, then Search engines attribute a rank to the website and make the page appear in the SERPs. If you want a better understanding of how Google works check out my dedicated article. We often talk about ranking factors. While we know that Google measure more than 200 factors and make daily changes to their algorithm, several industry experts have made some research to understand what was some of these factors. 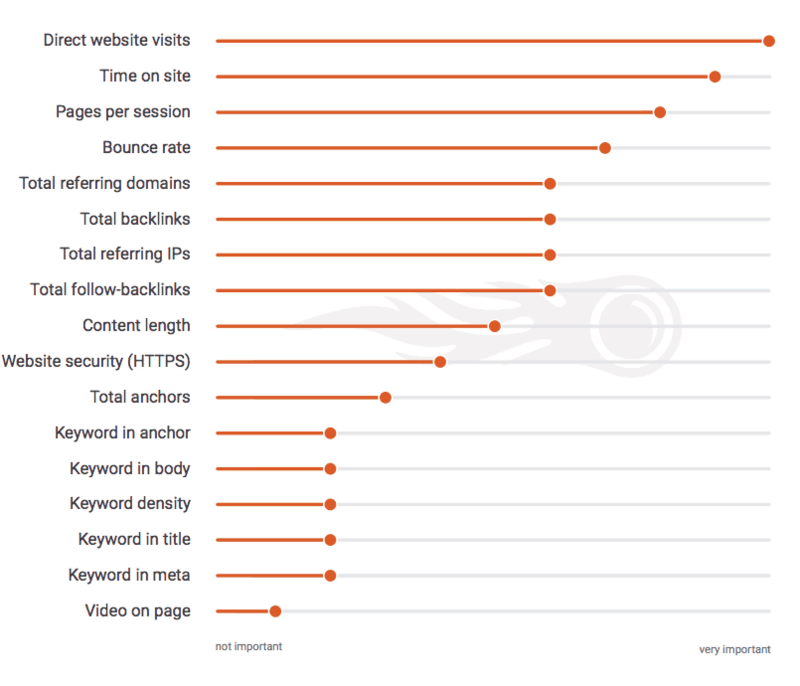 SEMrush has found that the number of direct website visits to your site will positively impact your organic SERPs position. No surprise here, engagement factors are at the top of the list. In SEO we are often talking about rankings or share of voice. Keep in mind that higher you rank the more share of voice you are getting, and to make it easier, the more money you are making. Keep in mind that 70% of the clicks go through the 5 first organic results, 25% go to Adwords and only 1% go to the second page. Why should you care about Search ?